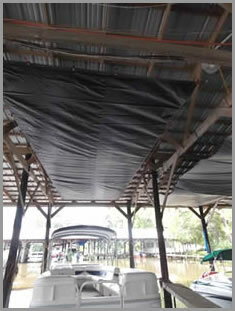 Protect your boat from spider droppings with our spider droppings tarps, Spider Shield. 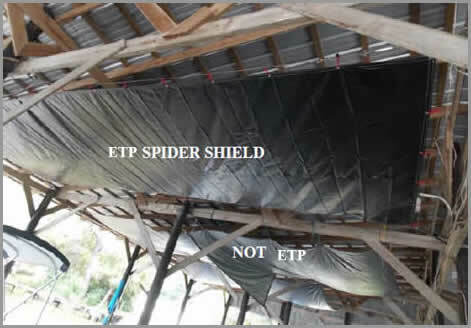 ETP Sports uses woven polypropylene fabrics in the manufacture of our Spider Shields. They are customized for your application and are the most effective, enduring and economical method for preventing spider droppings from tainting your boat’s finish in your boat house. You can’t eliminate the spiders but you can prevent the spider pellets from staining your boat. These “spider nets”, fabricated right here in our Mobile, AL plant. Each Spider Shield is custom fabricated to fit your boat slip specifications, while still being economical. Our spider dropping tarp is easy to mount and will resist tearing. 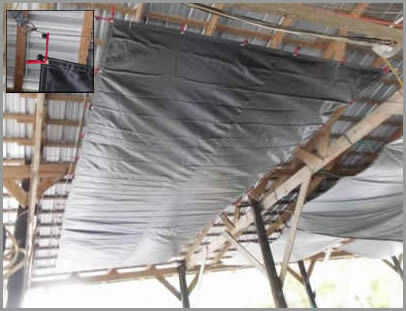 Other applications for a spider drop tarp would be garages, warehouses, or other storage facilities. Call us for your pricing and availability.